If you’ve been a fan of Adventures of Jean Lafitte for a while, then you know that we’re the best bayou tours around. Happen to be new to New Orleans or visiting for the first time? Bienvenue, Welcome! For old and new faces alike, we do our best to not only make a good tour experience, but also an easy online booking experience. Nobody wants to wrestle with a complicated site. Why get frustrated when you’re planning something fun? We’ve made sure that our website is not only beautiful, but user-friendly as well. We provide the best bayou tours in New Orleans. Book online today! At Adventures of Jean Lafitte, we’ve made it easy to book online. By using this link or pressing the button at the top of our website, you can book online in a snap. With straightforwardness in mind, we laid out everything you need on the booking page. The booking page itself is split into left and right sides. On the right, the first thing you see is information about the tour. You’ll also see an image of one of our experienced ship captains feeding an alligator—so you know exactly what’s in store! You might be so lucky to see lots of guys just like that gator on your own trip. Underneath we present our rates for every age, how long our tours last, and a small summary of the activity. Using the calendar on the left, you can schedule your tour for any of the times that are available. Once you choose your time, you can choose how many tickets you would like for each age group. We do not allow small children on the boat unless they are accompanied by an adult. You’ll have to schedule your adult ticket before theirs. We then give you an option to let us know how you heard about us and if you would like hotel pickup for an additional (but totally worth it) fee. Underneath, your total is displayed with proof that your information is secure. Finally, there are places to put in your contact and payment information. Next to these is some additional disclaimer information you may need. We strongly suggest that you read this in case of changes before your tour time. For the best bayou tours in New Orleans, book online today! Today, technology lets us do things that were never thought possible even ten years ago. Using the phone was the only tour-booking option back then. Today, you can avoid using the phone altogether and book online! And even this option is constantly evolving. It’ll be exciting to see where it goes in five, ten, or twenty years from now. One thing that’ll remain the same? The exciting fun you’ll have on one of our swamp tours! Our lovely headquarters can be found in Lafitte, which is a short distance from the Crescent City. Our address is 5145 Fleming Park Road and please make sure to arrive at least 45 minutes before your scheduled tour time. Have any questions for us? Contact us at Info@AdventuresofJeanLafitte.com or by using our online form. We can’t wait to see you on the water! Coming down to New Orleans for the spring? The locals would tell any tourist that they should see the swamps that thrive in Louisiana. And anyone who knows swamps know that the type of boat you use matters! 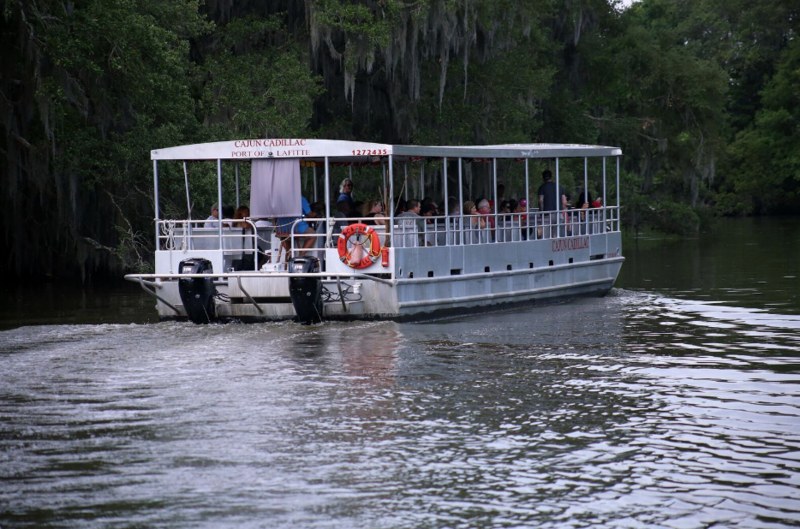 The Adventures of Jean Lafitte just so happens to use pontoon boats on our swamp tours. Of all the boats and tours out there, why should you decide to go on a pontoon tour in New Orleans? The Adventures of Jean Lafitte provides pontoon tours in New Orleans, but what does that mean? Because our guest’s parties can really range in size, we have two sizes of boats available. Our smaller boat is faster and fits smaller parties. On the other hand, our larger boat is much slower and fits much larger parties of people. If you’re staying in a hotel within the city of New Orleans, we offer hotel pickup! Please be ready to leave an hour and a half before your scheduled pontoon tour time. Our drivers have a short window to pick up everybody. So, it’s helpful to be waiting outside your pickup location. There’s enough space on our pontoon to have a bag, stretch your legs, and comfortably see the sights and sounds of the swamp. How Do Pontoon Boats Work? In the boating world, pontoon boats are at a height of popularity. That being said, how exactly do they work? A straightforward name, pontoon boats rely on pontoons to float on the water. Pontoons are devices that take on various shapes. These cause the boat to be able to float on the water while carrying large amounts of weight. Because the pontoons are located on the sides and under boats, the topside deck has tons of space! Once on the boat feel free to walk around when we’re stationary to see the sights and sounds of the bayou! The Adventures of Jean Lafitte provides the best pontoon tour in New Orleans. If you’re ready to book your tour of the swamp, you can easily book online! Have some questions for us? You can contact us directly, call us from 504-323-0570, or email us at Info@AdventuresofJeanLafitte.com. When you’re coming to see us, make sure you put 5145 Fleming Park Road in your GPS if we’re not picking you up. Because we can’t wait to take you on an adventure! New Orleans is one of the most unique places you can visit in the United States. One of the things that make us unique is our miles and miles of swamps and marshes that are just waiting to be explored. As an adventure for the family, it feels almost too good to be true. Bayou tours are not only family-fun, but they’re family-friendly as well. 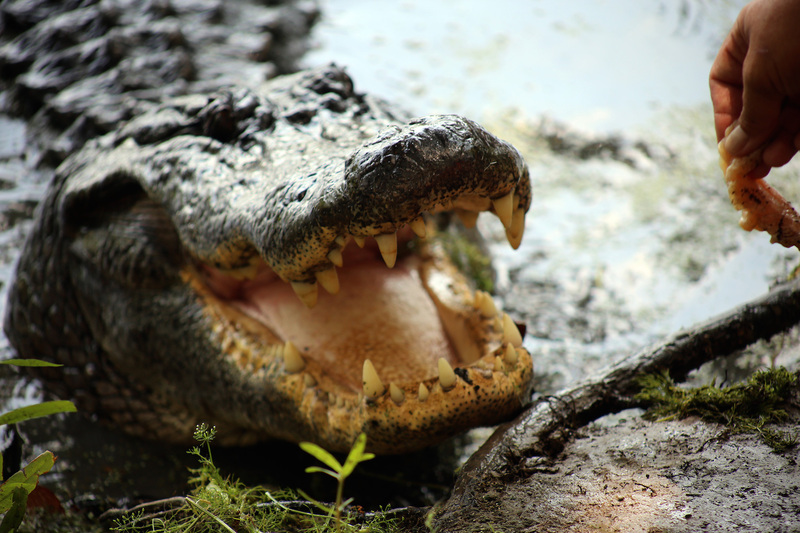 If you have any worries about boating safety or alligators, let us ease your concerns. The safety of your family is important to us at the Adventures of Jean Lafitte. Tours of the bayou in New Orleans are as safe as they are fun! New Orleans is a pretty warm place, but it’s can be a bit colder on the water. While we have no dress code, we do recommend bringing a light sweater of some kind. Our boats are raised a few feet higher than normal, so there’s never a chance your clothes could snag or fall off. All of our handrails are pretty high up as well, making it impossible to fall off the boat. Because of these precautions, you’re always safe on the boat. High humidity is a year-round weather status in Louisiana. Because of that, we have a pretty high level of mosquitoes and other tiny critters. While being out on tours of the bayou in New Orleans, you’re sure to encounter some of these bugs. However, with a good amount of bug spray, nearly every bug around runs for the hills. So make sure to pack an extra! We receive many questions about our swamps. However, one of the ones we get the most is this: Are they alligators or crocodiles? Looking so similar, it’s a pretty valid question. So, to answer that question for you, in Louisiana they’re alligators! Gators have a pretty bad rap from the media. Crocs and gators are often shown off in the media as vicious, angry creatures that will attack at any moment. For alligators, that’s just not true! As described in this article from the BBC, alligators are pretty docile creatures. Like any other creature, they only attack if we provoke them in some way. Such as being too close to a nest or food. For their safety, we ask that our visitors please keep their hands and feet inside the boat at all times. So don’t worry! You aren’t Captain Hook and these aren’t crocodiles. Alligators just like posing and laying in the sun. We want to make sure that you and your family have the safest tours of the bayou in New Orleans. Hopefully, we were able to squash some of your concerns. (If you have any others, get in touch!) The bayou isn’t dangerous, adventure awaits! Have some more questions and concerns for us? Give us a call at 504-323-0570 or contact us directly. Ready to tour the great bayou? You can book your tour here. We can’t wait to see you on the water! Sometimes, the most exciting part of traveling is the unexpected. What will it feel like being in a new place? What sounds and sights will you experience? What kind of people will you meet? Logistically though, it helps to know a bit of what to expect so you know what to pack and how to best prepare. Here are a few things to expect on a New Orleans bayou tour with Adventures of Jean Lafitte. New Orleans is a special place. It fuses Caribbean, European, and African cultures into one American city. The architecture, the food, and the accents all reflect this melting gumbo pot. Another thing that makes this part of the country so unique? The environment. After all, New Orleans is famously below sea level. 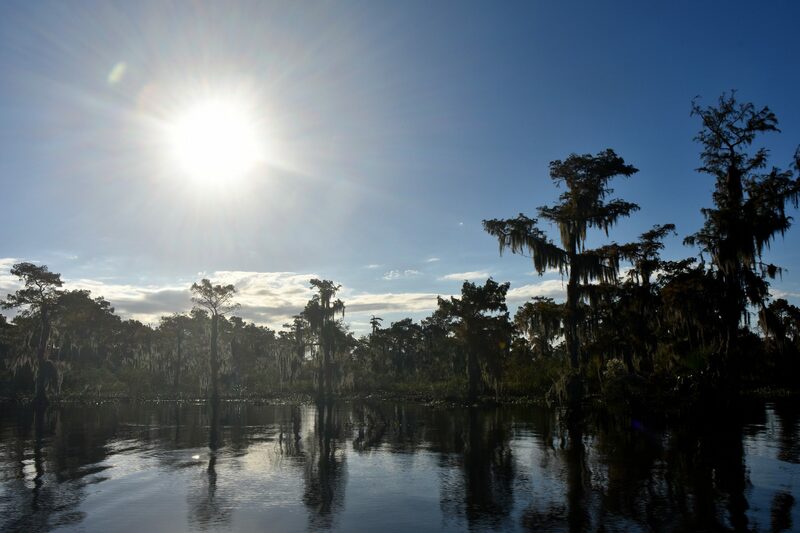 The area’s bayous, cypress trees, and exotic wildlife are definitely worth experiencing. “How do I get to my bayou tour?” This question is easy—we’ll pick you up! The bayou is about a 45-minute ride from New Orleans. Our comfortable, punctual buses offer door-to-door service. Or to be a bit more accurate, we provide door-to-dock service! We’ll meet you at your New Orleans hotel and bring you right to the pontoon boat. You won’t have to worry about taxis, Ubers, or following a map. So, you can expect to feel stress-free! We highly recommend comfortable, casual clothing. It’s the South, so 80% of the year you’re going to want to dress lightly to stay cool in our heat and humidity. But it can sometimes be slightly chillier on the water. You might want to bring a light jacket or sweater. If you’re adventuring in the winter months, then you may dress a little more warmly. You’ll be exposed to the elements on your bayou tour so put your comfort first! For the most part, you just need to bring yourself and be ready to have fun! But if you want to capture some memories, bring your camera (or your fully charged phone). The boats have an overhead covering, but in case of rain, you might want a poncho or raincoat. Putting your wallet and phone in a plastic baggie can add an extra layer of protection. You’ll also be glad if you bring sunscreen and bug repellant. We love living in south Louisiana, but unfortunately, the mosquitos do too. A bayou is a slow-moving body of water—you can’t tour it on foot! At Adventures of Jean Lafitte, our tours are on flat pontoon boats. They’re big enough for the whole gang and move slow for you to take EVERYTHING in. Get great pictures of the scenery and wildlife. Hear the sounds of the bayou: its birds, splashes, and breezes. We call the boat the Cajun Cadillac because the ride is smooth and you’ll feel like a bayou king! Have more questions? Contact us or call 504-323-0570. Ready to book your bayou tour adventure? You can do it online! You can also follow us on Facebook and Instagram. Social media is a great way to scope out some expectations. We’re expecting to see you for a bayou tour sometime soon! Louisiana boasts some of the most unique natural landscapes in the country. Sandy beaches on Gulf Coast barrier islands, piney forests along meandering rivers, there’s even a few hills. But perhaps the most famous of the Bayou State’s outdoor scenes are… the bayous! Just a short drive from New Orleans can lead you to these otherworldly landscapes. No Louisiana vacation is complete without adding some eco-tours to your itinerary. You might be planning on getting a little wild in the Big Easy. But we don’t mean just the kind of wild that happens on Bourbon Street. See the real Louisiana outside of the city on an eco-tour in the bayous. The party animals you’ll see out here include alligators, turtles, and raccoons. Nutrias are a tour favorite. They’re the large rodents with orange teeth who make meals of Louisiana’s marshes. Birders will go gaga over the chance to see egrets, herons, and even bald eagles! These characters won’t buy you a drink at Pat O’Brien’s, but they’ll be part of an unforgettable experience in Louisiana’s beautiful outdoors. Cypress trees, dangling Spanish moss, and palmettos reflected in slow-moving waters. You’ll slowly glide through these stately landscapes. There’s plenty of time to snap some idyllic, enviable Instagram pictures or simply take in the views. Friendly and knowledgeable local guides will tell you the stories of the swamp. They’ll explain the rich ecological and cultural significance. And they can answer whatever questions you throw at them. It’ll be hard to believe you’re only a short drive from the balconies of the French Quarter. Louisiana’s bayous and swamps play a role in every part of the state’s rich culture. The wildlife it produces became integral to Cajun and Creole cuisine. You can’t have a delicious alligator sauce piquant without the alligator. And what about the famous, sherry-topped turtle soup or a bowl of seafood gumbo? The waterways and flora also play in role in many of the local industries. But modernization, invasive species, and a changing environment have caused this iconic ecosystem to disappear. Eco-tours not only celebrate the area’s beauty and history but also educate visitors about the factors threatening its future. The Adventures of Jean Lafitte offers many bayou tours every day. And we even pick you up from your New Orleans hotel! It’s never been easier to get ecological in the Big Easy. In just a 45-minute drive, you’re transported to another world. Our 90-minute eco-tours are affordable and memorable. Meet tour guides who grew up surrounded by the wildlife of Louisiana. They’re so excited to share their passion with visitors. All of our pontoons are piloted by U.S. Coast Guard-certified captains. Call us at 504-323-0570 if you have some questions or go ahead and book a tour now. We look forward to hosting you. Why do people travel? To experience something new and different. To see unique landscapes and taste exotic foods. Louisiana is the perfect destination for those seeking new, different, unique, and exotic. If you’re planning on visiting New Orleans, consider adding Bayou Tours to your trip. With Adventures of Jean Lafitte, provide an easy, affordable—and unforgettable— Louisiana experience. The frivolity and cuisine of New Orleans are understandably high on everyone’s bucket lists. But you haven’t truly experienced Louisiana until you step into our bayous. Our bayou tours make it hassle-free. Adventures of Jean Lafitte will pick you up right from your New Orleans hotel. Our launch is only about 35-40 minutes from the Crescent City in the Jean Lafitte National Historical Park and Preserve. Choose from one of our many daily tours. Tours are offered throughout the year at a variety of times—from 9:45 a.m. until 4:00 p.m. Once you arrive, you’ll board one of our pontoons driven by a U.S. Coast Guard-certified captain. All boats are wheelchair- and stroller-friendly and the tour is appropriate for all ages. You’ll see moss-strewn cypress trees, local wildlife boasting both feathers and scales, and meet some true Cajuns—their wit and stories are often the main attraction! Check out our photo galleries to get an appetizer. Our namesake, Jean Lafitte, was a dastardly pirate in the early 19th century. Despite his reputation of looting and smuggling, Louisiana remembers him as a hero for his role in the Battle of New Orleans. Our tours take you even further back in time than this legendary buccaneer. You’ll experience the state’s untouched bayous as some of the original settlers of Louisiana, the Cajuns, did in the 1700s. Unsurprisingly, alligators are the official state reptiles of Louisiana. You’re very likely to see at least one of these giant lizards on one of our bayou tours. Biologically speaking, they are the living descendants of dinosaurs. The sight of one of these huge creatures sunbathing on a log may just transport you to prehistoric times as well. In 90 minutes, you’re transversing millennia of history! Ready to drift back in time and confront the REAL Louisiana? Book your tour—and schedule your hotel pickup—right from our website! We accept all major credit cards. You can also contact us online or call 504-323-0570 if you have questions or special requests. To further prepare for your trip, check out our list of frequently asked questions and this handy guide on what to pack. In the meantime, follow our Facebook and Instagram pages to tide your excitement until you set sail with us.